1 of 3 Heat oven to 450 degree F.
2 of 3 Gently lift skin from breasts and legs and season with the salt and pepper. Place some of the garlic slices and fresh herbs under the skin. Place remaining garlic and herbs in the cavity of the chicken. 3 of 3 Place chicken on a rack in a large roasting pan. Pour the chicken broth into the bottom of the pan. 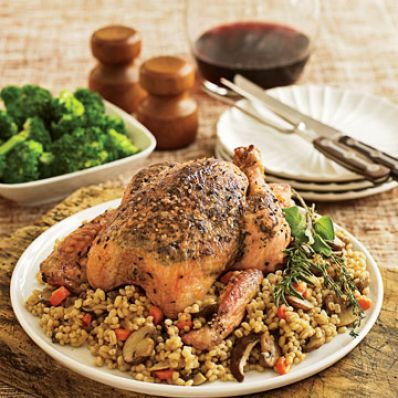 Roast for 50 to 60 minutes or until the internal temperature reaches 170 degree F on an instant-read thermometer. Tent with foil halfway through cooking. 1 of 2 Meanwhile, in a medium-size saucepan, heat oil over medium-high heat. Add onion, carrot and mushrooms and cook, stirring occasionally for 5 minutes. Add broth, barley, salt, pepper and nutmeg. Reduce heat to medium, cover and simmer for 15 to 20 minutes or until tender, stirring occasionally. Add a few tablespoons water if mixture becomes too dry. 2 of 2 Allow chicken to rest 10 minutes. Remove skin, slice and serve with pilaf.